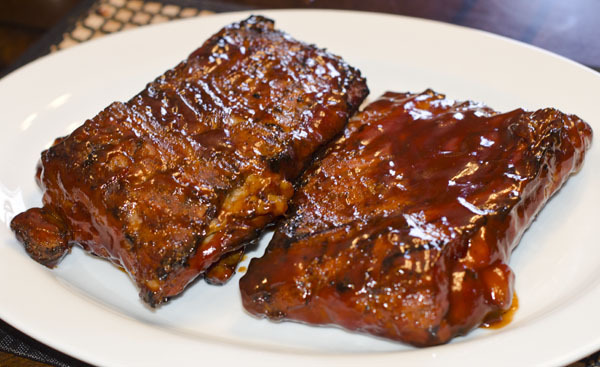 Delicious, soft, fall off the bone barbeque pork ribs! Season the ribs with salt, black pepper, barbeque seasoning. Marinate it for a couple hours or overnight. Fire up the grill and grill the ribs for 10 minutes on each side until it's brown. In a large aluminum pan, place the crushed ice, chopped onion, and apple cider. Place the ribs on top and seal the top with aluminum foil. Place the alumimum pan on the grill for 1 hour and a half (or two hours). Cover the grill. Continue to check the pan often so that the pan still has juice. Do not let the pan go dry. If it starts to go dry, add more apple cider or water. Place the rib back on the grill and add barbeque sauce. Turn it on the grill so that both sides are nicely charred. Serve! If you don't have a grill, you can also follow these steps and broil them in your oven.